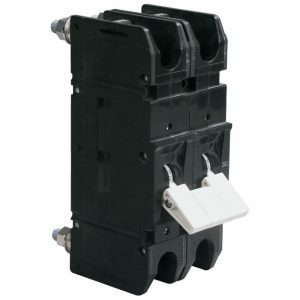 Carling Technologies’ F-Series circuit breakers were developed to meet the demand for protection in high current DC installations. The heavy duty construction of the F-Series is designed for critical applications in marine, transport and alternate energy industries. 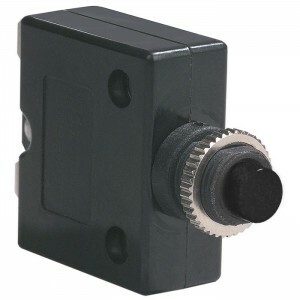 Share the post "F-Series Magnetic Circuit Breaker 2-Pole 250 Amps"
Carling Technologies’ F-Series circuit breakers were developed to meet the demand for protection in high current DC installations. The heavy duty construction of the F-Series is designed for critical applications in marine, transport and alternate energy industries. The F-Series are often used for the protection of main DC supplies and large loads such as bow thrusters in vessels, for example. The standard range includes both single and double pole versions, with white handle actuators, threaded stud terminals and rear panel mount fitment.